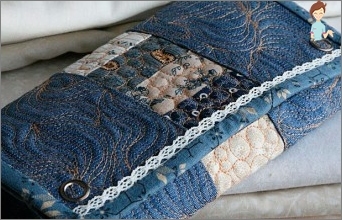 Home / Needlework / Old Jeans: throw can not leave! Old Jeans: throw can not leave! Each of us has a home at least one pairold jeans. Where they faded where torn, but to wear them on the street anymore. And throw a pity. One way to give new life to old jeans - Patchwork or sewing patchwork. Of course, much You can sew of whole jeans, for example, a skirt or a large shopping bag. But what to do with the remains? It turns out, you can sew patchwork no less amazing things. Widely used scraps of denim fabric in the interior. 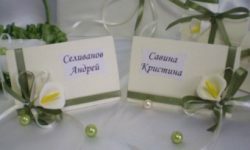 Of the pieces, you can make the unusual cover for chair or sofa. A covered denim floor lamp will add originality to your home. Generally from old jeans on the technique of patchwork can sew anything. 6. apron and slippers for the house and much more. If you live outside the city, or if you have a cottage, thenYou can make a small tent from the remains of denim. your kids will play In the resulting house. You can also please the child a brand new jacket or trouser legs by using your old jeans. For example, to sew for my daughter sundressyou can be quite a leg. And if you are ready to sarafanchik prishёte bright elements of another fabric, this dress will be a favorite of your daughter. 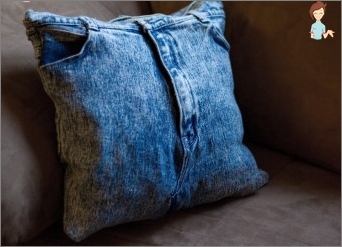 What else to do with old jeans? Do you have a dog? Make her a gift - sew odyozhku of your old jeans. Your pet can be proud to walk down the street you have made trousers. If you have a cat, then make her original house decorated denim. By the way, due to the strength of the fabric, then it is possible to make a leash or embellish portability. Thus, the capacity to use old jeans, andand scraps of denim, a great many. Let's pay more attention to the production of skirts, blankets, and even some small items from old jeans patchwork. Do you have some whole and some jeansindividual pieces of denim? From all this you'll have a great long skirt. So, for the manufacture of the skirt pattern you will need paper, old jeans and the cuts of denim, thread and sewing machine. Now, from the top of the jeans do the harvesting for the skirt. To do this you need to cut the leg at a suitable level for you to strut and internal seams. Now you can start carving elements bottom. Dimensions flaps may be of different lengths and shapes. The main thing that they were combined into a single fabric for the skirt hem. When all the patches are cut, and you do not forgethandle their edges, you can safely begin to sew them to the top of your finished. To skirt seemed even more original, you can use to decorate a few buttons or buttons. If you want, you can sew pockets or more stripes - all in your hands. You can also cut a few pieces of fabric and make patchwork belt. Here we have turned the skirt! If you have available a lot of patches, then whyI not try to make them a blanket. To do this, you also need to be reserved by threads, and of course, patience. So, to begin to cut the fabric squares or triangles identical in size. Before you cut it would be nice to draw a schematic, as it should be to look your blanket. Once you have decided on the configurationflaps and treated their edges, start sewing. Attention! When cross-linking should be left allowance of about 1 - 1.5 cm. The reason for these dimensions - the thickness and strength of denim fabric. 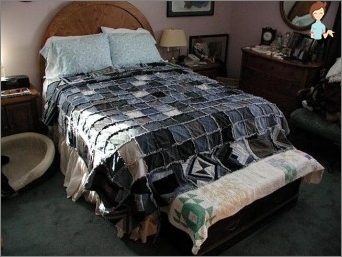 The finished quilt looks very nice and canperform several functions: they can hide, you can use it as a blanket on the sofa or chair. Another way to use a blanket - the carpet on the ground. If you choose to sit somewhere in the park or near theriver on earth, it is best to take it with a blanket, and you will not regret it. Due to the strength and thickness, you will not be cold to sit on the ground near the pond. Previous versions of undoubtedly good, but thatto do if you have quite a bit of tissue. In this case, either skirt or blanket stitch, you can not. Dont be upset! 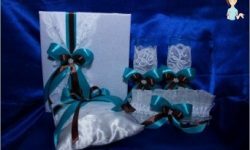 But you have the opportunity to make small pillows on a sofa or a small handbag clutch. Let's start with the pads. So, you need the remnants of old jeans, thread and sewing machine. Scraps of fabric cut into strips, about the same width. If you have leftovers from various jeans, itall perfectly, as the next step bude stitching these strands together. But you need to make a special way: each successive strip bude shift towards 4-5 centimeters. The fabrics were cut into verticalstrip. To ease the job can be first hold line handle on the inner side, and then cut them. The resulting strips sew back together. From the resulting tissue vykroyte pillow. 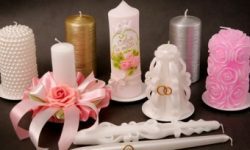 This element of the decor definitely attract the attention of your guests and create a unique home-like atmosphere. Now we'll sew a handbag-clutch. You will need jeans and lining fabric, thread, scissors, pieces of artificial leather and glue. From denim cut flaps of any configuration, as long as they are then merged into a single fabric. Then from the resulting fabric, cut shape. Make the lining of the bag. Then sew the handle. You can make them out of cloth or use a piece of leather strap. Decorate the resulting clutch bag a variety of ways. You can use pieces of artificial skin or patches, purchased in the store. 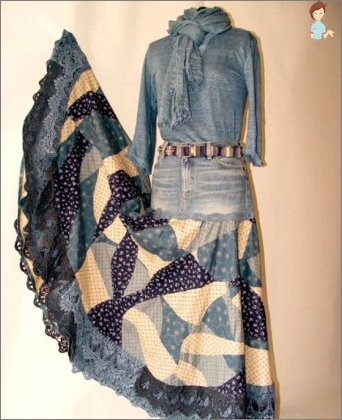 As you can see, made from old jeans can be manydifferent interesting things. You can change the interior, can sew new clothes for all family members, or come up with something of their own. It all depends on your imagination and desire to create.